ALI ZAFAR performed for children with cancer at ‘Shaukat Khanum Memorial Cancer Hospital & Research Centre’ today. 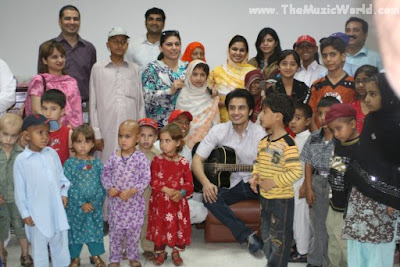 ALI ZAFAR always do such kind of charity works. Last time, ALI ZAFAR helped for the marriage for a poor girl whose marriage stufs was burnt. 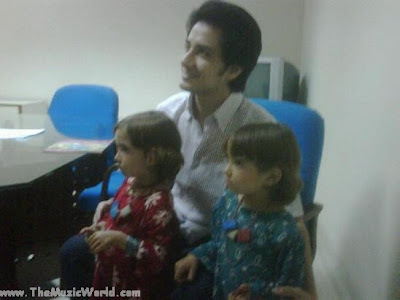 On the other hand, Ayesha Fazli, Ali Zafar’s wife felt like adopting the cancer patient kids and hoped that these adorable little kids are cancer free soon. Here are few of the pics of ALI ZAFAR with kids surrefing from cancer.